What Do You Do When Your Laptop’s Touchpad Stops Working? A non-working laptop touchpad is a real pain. If it’s only just stopped working, try switching your machine off and back on again. That sounds like a cop out, but it could be all your laptop needs. If that doesn’t work, try this. Has it been accidentally disabled? It is possible you have disabled it accidentally. This usually happens when the Fn key is depressed along with another key. This would probably have been one of the function keys. As to which one, that will be different for different laptops. Start by looking out for a symbol that could represent your touchpad on one of the function keys. Or you could Google your model and “disable touchpad” to see if that helps. If that doesn’t work, check your touchpad settings. If none of the above help, it may mean you need a new driver. Go to your laptop’s manufacturers website and search “touchpad driver” to see if there is one you can download and install. If all else fails, you could be looking at a hardware problem. That means either sending your laptop off for repair or buying an external mouse to get around the problem. Hopefully, one of those suggestions has helped you get over your unresponsive touchpad problem. It’s not often we blow our own trumpet here at MPM IT. However, we think reaching this milestone gives us the right to make an exception. For 15 years we have been helping businesses all over Stowmarket, Ipswich, Bury St Edmunds, and everywhere in between. Our unique ‘pick and mix’ computer support services provide the flexibility small businesses need. 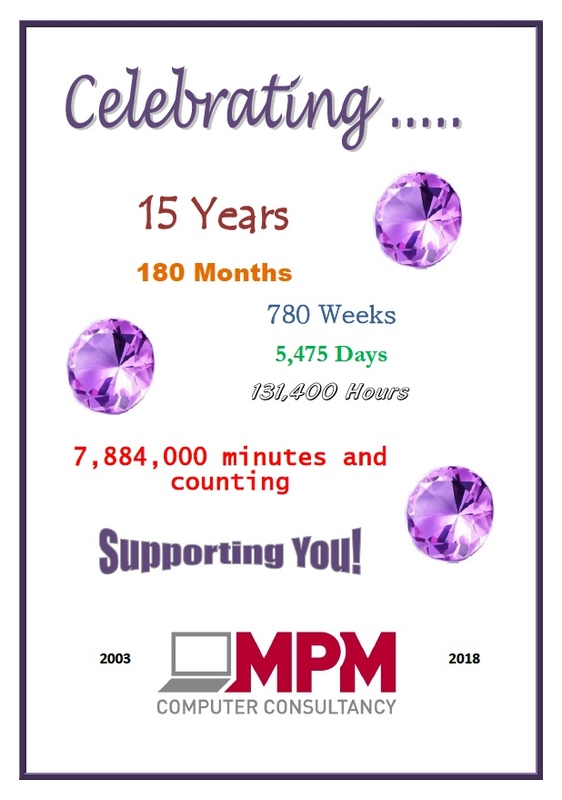 To find out more about what MPM IT can do for you, check out our website, or call 01449 770704. How Seriously Do You Take Technical Support? Technical support is one of those things many see as a luxury rather than a necessity. They don’t see the point in it until something goes wrong. You know how annoying it is when your phone, laptop or PC lets you down; it feels as though your world is ending. So imagine what it’s like if you experience an IT failure in your business and you don’t have technical support. When you bought your computer systems, you probably though the tech support elements were just a nice little earner for the vendor. After all, you’re a dab hand at most technical things; surely you could sort out any issues that crop up? So what about cyber threats, ransomware, software or hardware failures? How good are your skills then? Are you one of those statistics? If so you must think about getting technical support in place. When you look at the cost of professional support against the amount you could lose in downtime or a reputational hit should, it’s a wise investment. If you are and you would like us to be your IT department and help minimise the risks to your business, contact us at enquiries@mpmit.co.uk or Office 01449 770704, Mobile 07733 262116. DIY tech support is a daunting prospect even for the most techie minded of you. However, there are times (especially during the holiday season) when you may have to ‘go it alone’ when it comes to sorting out your PC. We found a useful blog post on PCWorld.com that addresses some of the most common problems you could tackle alone, but there is a caveat – if you don’t feel happy dealing with it yourself, don’t. 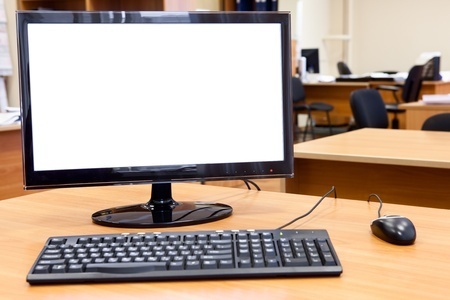 You have to be honest about your limitations because if you muck it up, you’re going to make it worse, which is why we always recommend you call in professional IT support. 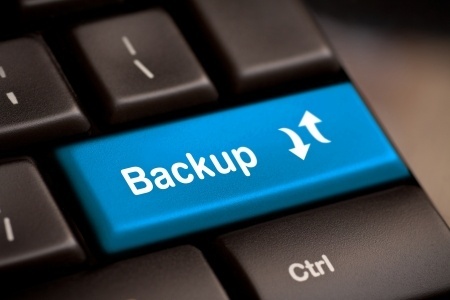 I know it sounds like a no-brainer, but before you do anything else, restart your computer. Matthew Petrie of Falcon Northwest technical support says that most of his customers solve their problems with this simple step. Regularly checking for operating system updates is important, because forgetting to do so could significantly impair your PC’s performance. 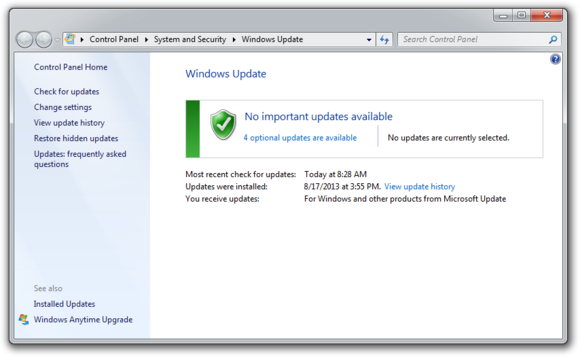 While you’re at it, make sure that your operating system is fully updated by running Windows Update. Neglecting updates could deprive you of important bug and performance fixes. If you’re having problems with a peripheral, try switching it on and off. If that doesn’t work, try disconnecting and reconnecting the device. As a last resort, download the latest drivers and perform a full reinstall. The first step to fixing a slow computer is to verify that your machine is the actual source of the problem. Videos that seem to buffer forever, and websites that take ages to load, may not be your computer’s fault. Geek Squad agent Derek Meister claims that many people mistakenly identify a slow system as the problem when “it’s actually not the computer, [but] their broadband connection.” See “Downloads are taking forever” below for instructions on how to use Speedtest.net to diagnose a slow connection. 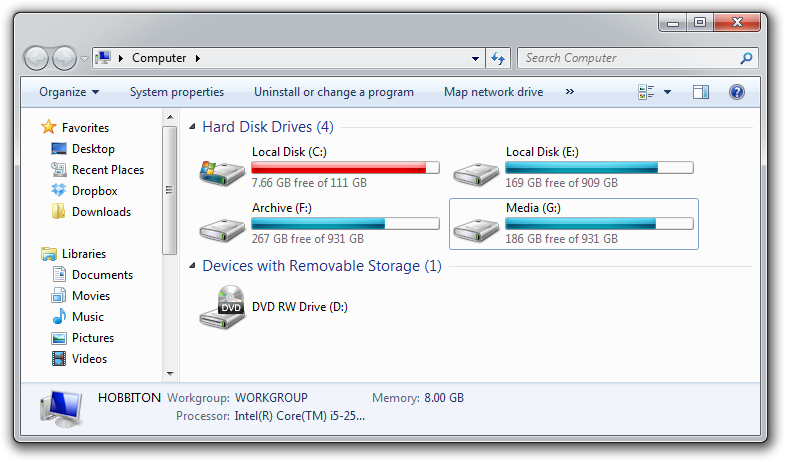 If the problem is your PC, check whether you have plenty of free space on the hard drive holding your operating system. Windows needs room to create files while your system is running. If your hard drive is maxed out, performance suffers. Now is the perfect time to clear some space. If your computer’s operating system resides on an overstuffed C: drive, clearing out some space could boost OS performance. Microsoft’s System Configuration tool is your next-best bet for tackling slow performance. Many applications launch automatically when your machine boots up, which can stretch out boot time—especially on older, slower PCs. Make a habit of trimming the startup items. Open the tool by pressing Windows-R, typing msconfig, and pressing the Enter key. Checking the Startup Item and Manufacturer columns is the best way to figure out which potential performance-killers you can safely disable. Avoid messing with any of the services and programs that have Microsoft Corporation listed as the manufacturer. Items such as AdobeAAMUpdater, Google Update, Pando Media Booster, Spotify, and Steam Client Bootstrapper are all fair game. 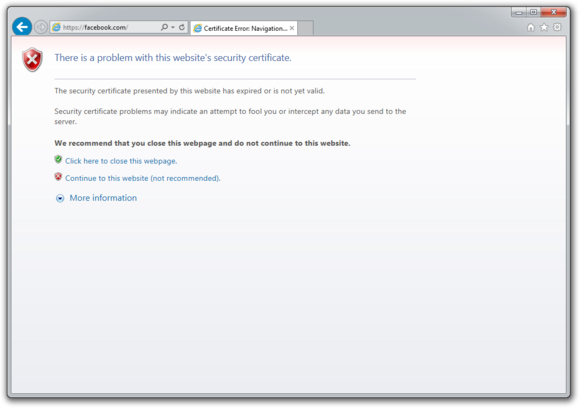 Regardless, err on the side of caution: If you’re not sure what the program or service does, don’t disable it. 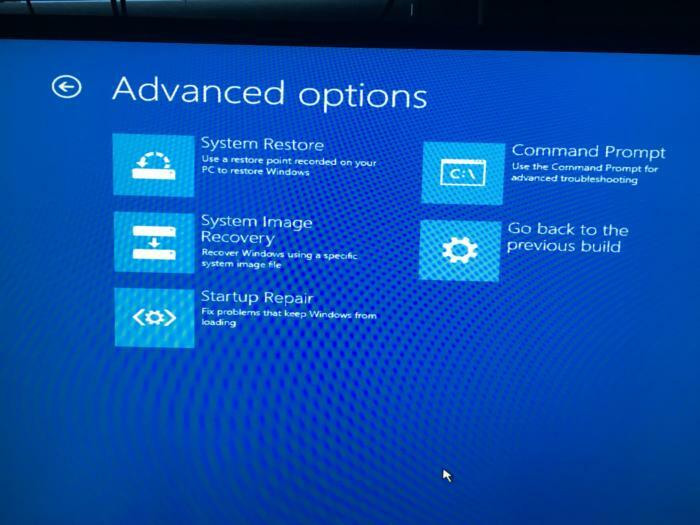 Windows’ System Configuration Tool lets you disable programs and services that automatically start when you boot your computer. Once you’ve made all your changes, click OK and restart the computer. It should boot up quicker and feel noticeably faster. 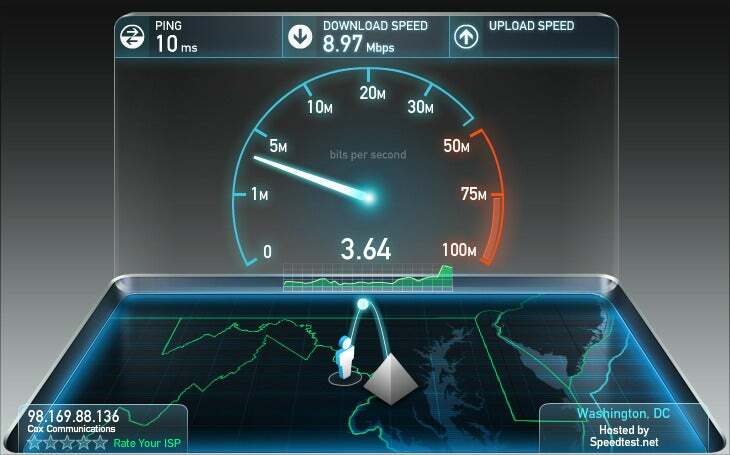 Speedtest.net is your best friend when you’re having connectivity problems. Run a speed test to see what your download and upload speeds are—ideally they should be at least 50 percent of your Internet service provider’s advertised speeds, with a ping under 100 milliseconds. If the speeds seem solid, make sure that you aren’t inadvertently downloading or uploading anything. 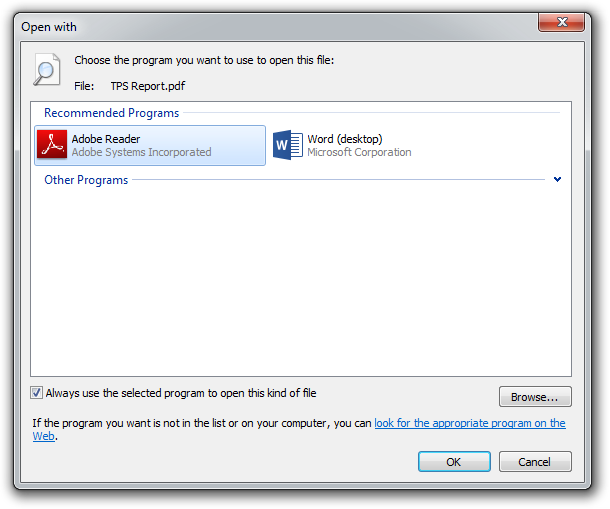 Many torrent downloading programs run in the background and minimize into the system tray instead of the taskbar. Is your computer making weird noises? If you’re lucky all you’ll need to do is give the machine a thorough cleaning. Modern computers have safeguards that shut down the system if a component is overheating, which can be the cause of frequent restarts when you’re running resource-intensive programs or video games. These tips are really handy, and we were thrilled to stumble across this post, so make sure you bookmark it for future reference. However, as we mentioned at the start, please, please, if you’re not comfortable trying to do this yourself call in the professionals. Source: Huge thanks to PCWorld.com for their excellent advice. Your Windows 10 PC is getting slower. Everything is taking longer. Your patience is being tried as your frustrations grow. Do you just accept that’s what happens over time, or do you do something about it? The answer is the latter, and we have five handy hints to help you speed things up. This is so obvious you may have already tried it. However, if you haven’t it’s time to reboot. Putting your PC to sleep helps save power, but it does little else to enhance performance. A reboot will spring clean Window’s brain to give is a fresh lease of life. You can do it every day is your machine is exceptionally slow. Today, everything is about saving the environment, which is why your PC wants to work as energy-efficiently as possible. However, it is possible to trade electricity for speed. All you have to do is right-click Start and then select Power Options. Pull down the Show additional plans option and select High performance. The drawback is that you’ll use more electricity and it will have a detrimental effect on your battery’s performance. Trading a few aesthetics will also give you a bit more speed. Right-click Start, and select System. 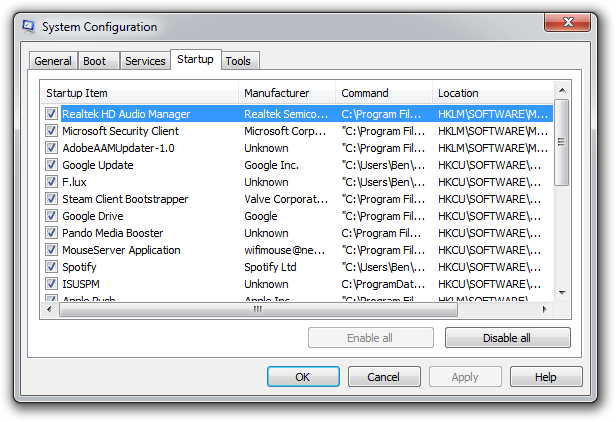 Then in the Control Panel’s left pane select Advanced system settings. In the resulting System Properties dialogue box click the Settings button in the Performance box. In the next box uncheck some of the options or select Adjust for best performance. When your PC fires up some programmes will automatically start, slowing down performance. Usually, there is a number that aren’t required immediately and therefore can be prevented from autoloading. 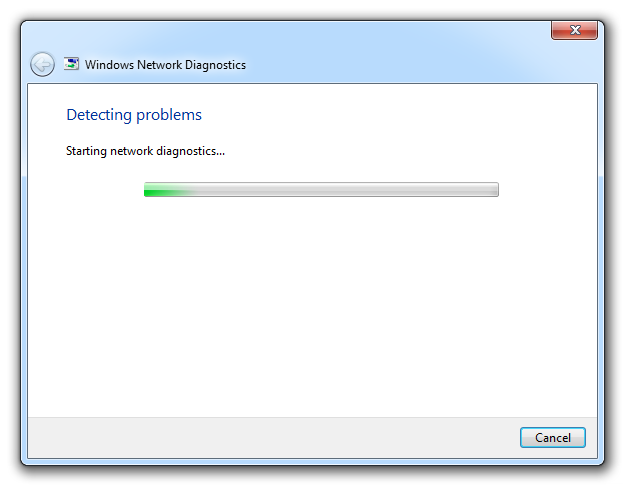 To check which programmes are autoloading, right-click the taskbar and select Task Manager. Click the Startup tab. This will show you all the autoloading programmes. Just right-click any you don’t need on the Startup tab and select Disable. Windows 10 likes to helpful and loves to provide you with tips on how you can better use it. The problem is, to get this information, it’s keeping a beady eye on how you’re using your PC, which slows it down. To turn this feature off click Start > Settings > System > Notifications & actions. At the bottom of the Notifications section, turn of Get tips, tricks and suggestions as you use Windows. Tech support is something we all need from time to time. Whether your printer has stopped working, your PC slowing down or your external hard drive giving up the ghost, you’ll need tech support. Well, most people reach for Google (other search engines are available) to find a tech support number. Makes sense, right? 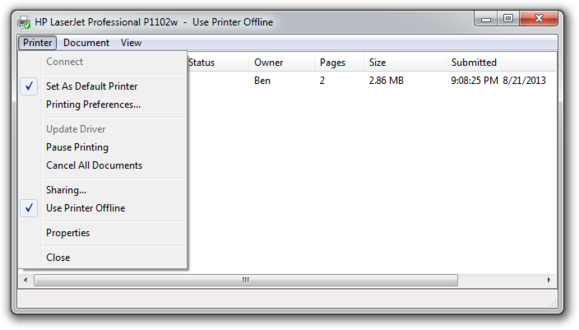 [I was] having trouble printing from my laptop to our HP wireless printer, which until a couple days ago was working just fine. Called HP help line and had the most bizarre experience. Previously, when I first installed the printer, I had the best help-line call ever and we were able to solve the problem. This call was among the worst. The technician hooked into my PC remotely, downloaded a program that was checking for errors, etc., then proceeded to try to sell me their annual service for PC repair, etc., for “only” $199 per year. I could not get the guy off the phone. In fact, after telling him to get the hell out of my computer and hanging up on him, he called me back and harangued me for using bad language and demanding to know how I was going to get my computer fixed without their assistance! If you think that doesn’t sound like HP you’re right, it wasn’t. After Googling for a tech support number, the guy called the first one on the list. As you’ve guessed, it wasn’t HP. When you’re in a panic and need help straight away, it’s an easy mistake to make, but also a costly one. There is only one way you can be sure you’re speaking to the right person, and that’s by calling the tech support number on the company’s website. Yes, it might take a bit of finding, and you might not get the immediate help you want, but at least you’ll know you’re speaking to a genuine tech support team that knows what it’s doing. Cutting corners is tempting when you’re pushed for time. However, in the long run, it pays to stay calm, think carefully and make sure you’re calling the right experts. FOBO – or the Fear of Being Offline is not a medically recognised condition, but it can be a real problem. Modern life is increasingly dependent on the Internet. Managing finances, shopping and communicating with friends and family is all done online. We rely on apps to give us the news headlines and emails to keep us up to date with projects at work. Downtime is usually spent taking a quick peek at our social networks for a quick fix of humour or gossip. This obsession with connectivity has a dark side though. Some people experience genuine emotional distress when they lose access to the internet. In fact, some people even have problems with the thought of not being able to go online. How do I know if I have FOBO? Ultimately, if connectivity is your priority in most situations, you may have FOBO. The best protection against FOBO is to reduce the risk of losing internet access. This means taking steps to ensure that you don’t lose connectivity in the first place. This all might sound a bit daft, but people really do experience anxiety at the thought of going offline. Hopefully these tips will help to manage those concerns. In the good old days, every new PC came with a recovery CD or DVD, so if things went pear-shaped, you could easily restore things to how they were on day one (although you’d lose any files or applications you’d created). Today, manufacturers just put an image of the system as it left the factory on a hidden partition of your primary drive. “A Windows recovery disk builds on this idea. 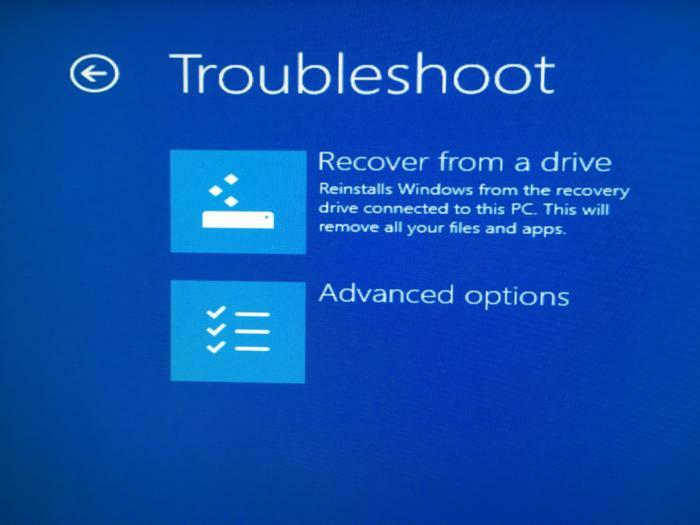 In addition to letting you reinstall Windows, it includes several troubleshooting tools, which can be lifesavers if your system won’t boot. First, you’ll need an 8GB to 16GB USB drive and insert it into an open USB port on your PC. Then, go into Windows’ Control panel (right-clicking the Windows icon is the easiest way) and type create a recovery drive into the search bar. The manual method would be to go to System & Security > Security & Maintenance > Recovery. If prompted, enter your admin password. In the resulting dialogue box, check the box labelled Back up system files to the recovery drive. With your recovery drive created, you’ll have to boot from it to use it. How your PC boots from USB varies according to your PC’s age and motherboard, but typically you can press one of the F-keys during boot to arrive at a boot selection window. From there you select the USB drive, you’re using, and it should proceed to boot from the recovery drive. When you successfully boot from it, you’ll see a screen that offers a Troubleshoot option. Click on that, and you will see the following: Recover from a drive, and Advanced options (and possibly Factory Image Restore, if available). The first option lets you reinstall Windows as a clean installation, which means you will lose all your data and installed applications. System Restore: Use this to revert your PC to a happier time when things were working normally. This does not affect your data, but it does affect installed programs as it replaces the registry with an earlier version. System Image Recovery: If you’ve used the image backup tool in Windows 10, this would be where it would come in handy. You can restore the image of your PC at the time you created the image, which includes all your data and installed programs at that time. Startup Repair: This is sort of a “black box” in that it tries to fix whatever issue is preventing the system from booting, but it doesn’t tell you what it’s doing or, if successful, what the problem was. This is the first thing you should try, as it’s the quickest and least invasive. Command Prompt: This can be useful for a wide array of tricks and tactics, most especially running the SFC /Scannow command to scan and fix corrupted system files. We all know the command prompt is a wizard’s toolbox, and if you know what you’re doing, the possibilities are almost endless. Go Back to the Previous Build: Though worded a bit cryptically, this lets you revert your PC to the previous build of Windows, meaning the one before whatever update turned everything pear-shaped. As you can see, it’s quite useful to have one of these recovery drives handy. Do yourself a favour and make one now. Have You Installed the Emergency Flash Patch? 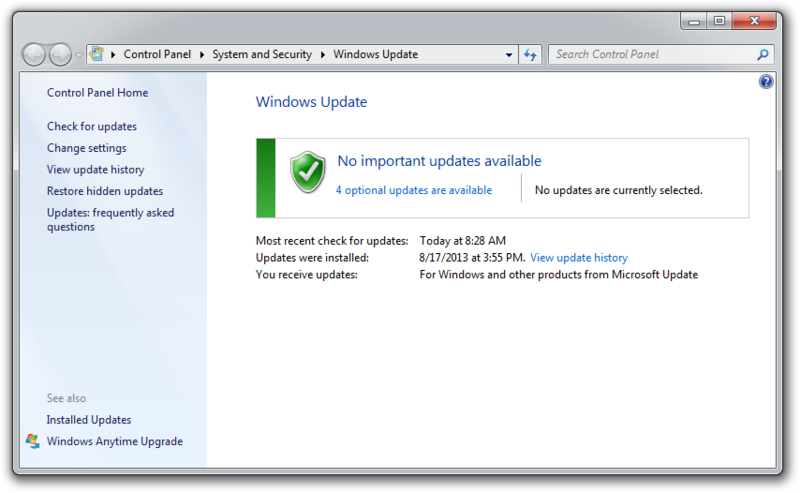 As a PC user, you rely on Microsoft’s regular patch updates to make sure your system works smoothly and remains secure. Adobe and Microsoft release Flash Player updates at about the same time to limit the number of vulnerable users, but in February something went wrong. 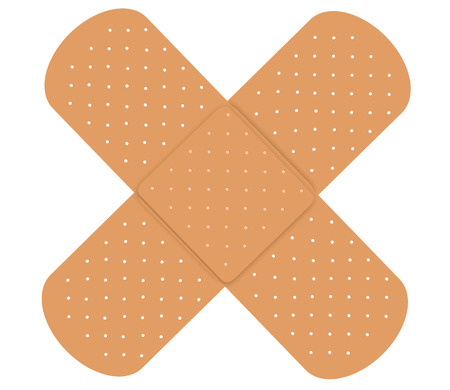 We’re not sure what because Microsoft is keeping tight-lipped, but for some reason, the software giant cancelled it’s usual Patch Tuesday that month. Historically it’s been shown that attackers analyse Flash Player updates to find vulnerabilities, which are then used to attack the users who haven’t patched their systems. That’s why it’s important to double-check whether you have downloaded the patch. If you haven’t, your whole system is at risk. Author itsupportbloggerPosted on June 14, 2017 June 14, 2017 Categories Internet security, IT Security, IT Support, Microsoft, online securityTags Adobe, Flash patch, Microsoft, patch updates, security updatesLeave a comment on Have You Installed the Emergency Flash Patch? Security isn’t always the first thing you think of when you get your first computer. The excitement of getting it out of the box and working your way through the setup procedure is much more fun. You can’t wait to get on the internet and besides, all that security stuff is just hype to get you to spend more money, right? Online security threats are real, and if you don’t take it seriously, you could end up losing your data and watch your beloved computer slowly curl up and die. Here are our top 10 tips for new computer owners. None of them are complicated, but they’re all important. If you follow those tips as you start to get to know your computer, you won’t go too far wrong. Above all, take care of it, and it will take care of you.